For nearly 30 years, I’ve been hiking the west side of Rocky Mountain National Park. Back in college, I also spent a few summers working in the Fraser Valley. During that time, I took a lot of folks fly-fishing, and I learned some great little secret places to fish along the way. One of those places is just west of Grand Lake, Colorado. The North Inlets trail is a beautiful path that leads along the stream and up into the Rocky Mountains. A little over 3 miles up, the roaring Cascade Falls is a perfect stop for hikers to take in the view of water flowing over rocks and down the valley. And this is where most folks turn around. But beyond these falls, the trail continues up and over the Continental Divide and down into the Estes Park area. In these parts, off the beaten path, the fly-fishing can be pretty amazing. The brook trout are not big, but they are plentiful and hungry. There are also lakes up in the high country that hold sizeable cutthroats. One of my favorite places in Rocky Mountain National Park is the North Inlets Trail. This path starts just outside of Grand Lake and leads about 3.5 miles up to Cascade Falls, then further up and over the mountain, eventually connecting with other trails to lead back into Estes Park. Along the way, there are spots for great fishing. I used an underwater housing device to shoot underwater. 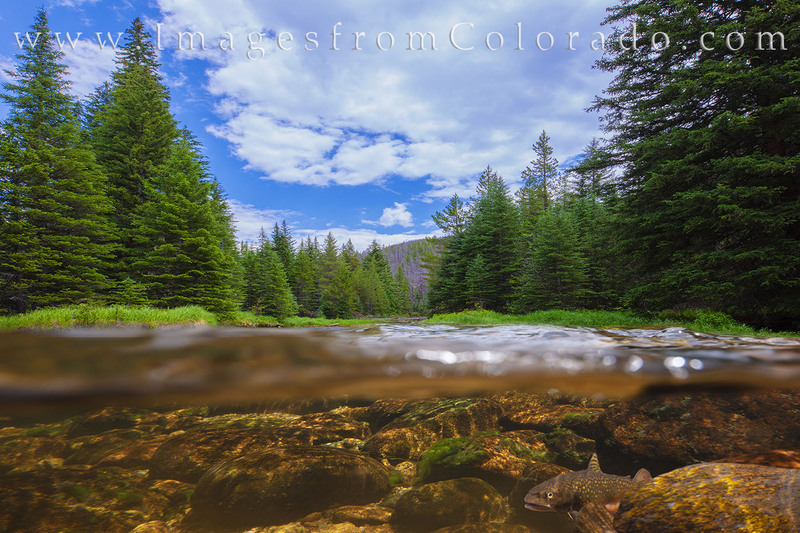 After more than several shots, this small brook trout appeared and completed the image. We eventually made our way back down, and just as on the way up, I ended up lugging two backpacks most of the way (one on my back, one on my front). I should have known, but I was just happy to have my oldest daughter along. A stop at the 7-Eleven in Granby for slurpees completed the trip before we arrived at home back in Winter Park. Days like this I will remember for a long time, and I know they pass all too quickly. But I’m glad I had those moments. If you have any questions about these photographs from Rocky Mountain National Park, please do not hesitate to contact me. Posted in hiking, mountains and tagged rocky mountain national park, RMNP, north inlets, trout, brook trout, fly fishing.